Hi, friends! It’s so hard to believe that another school year is upon us! This summer just flew by! I tried to be really good about not spending my whole summer in my classroom. The kiddos start after Labor Day, but I went back in to begin setting up my classroom on August 10th. The teachers officially started last week with PD. I spent a little time in my room yesterday prepping a few last minute things and taking a few pictures… so without further adieu, I bring you my classroom reveal! If you turn left, you will see my small group table. This is my most favorite spot in my entire classroom! I just added those lime dry erase spots this year, and I can’t wait for the kiddos to use them! They really aren’t that bright, nor are those lime green bins… #lightingproblems. I scrounged that giant shelf behind the table from a coworker a few years ago. It’s the perfect size to hold the materials for my daily lessons (clear bins across the top), weekly copies (clear bins across the top), teacher manuals (lime green bins), guided reading and math supplies (drawers), and teacher read alouds (pink crates across the bottom). I love that I have everything right at my fingertips! Just above my small group table is my “reading wall.” On this wall you will find a pocket chart with our daily schedule (A Year of Many Firsts and First Grade Parade) and center rotation cards, as well as story element posters (Mrs. Ricca’s Kindergarten), CAFE board, and I Can statements (Mrs. Ricca’s Kindergarten). Our book boxes are to the far right. I like to label these with numbers, so that I don’t need to keep labeling them each year. Total timesaver! These particular boxes are from Romanoff Products. You can order from them, but you will need to order an entire case of whatever you are ordering… or split it with someone. The magazine files come 12 per case. Trust me! It is so much cheaper than ordering them from other sources. If you want a class set, go directly to the source! And, I am in no way affiliated with this company. I just love their durable products! The shelves under our book boxes were built by my dad. Every summer, we work on a new project for my classroom. These were built a few years ago from the old shelves inside my bathroom cabinet. Much like my dad, I do not throw anything away that I think will prove useful in the future! I am so happy I kept these boards piled up inside my garage! They were already finished… meaning I didn’t have to paint or stain! Plus, they make the perfect storage area for all of our everyday math and literacy manipulatives. To the right is our classroom library sorted by topic. I also have a leveled library, which I will share in a bit. 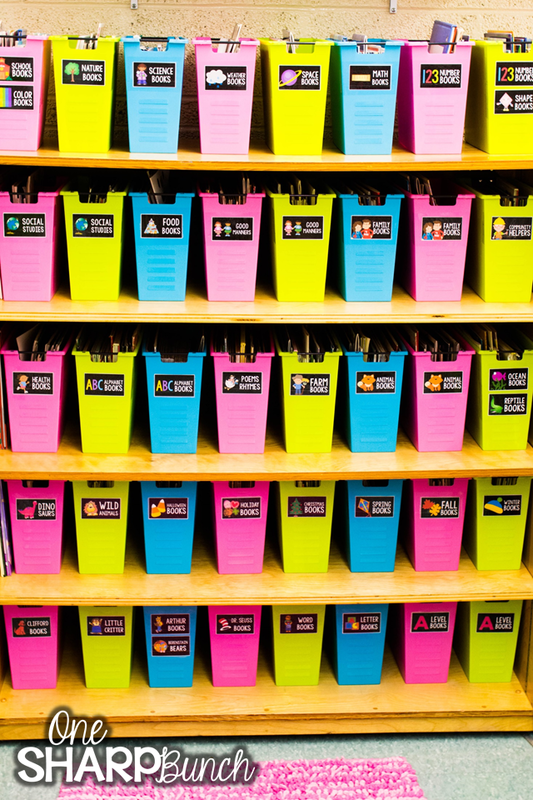 These brightly colored book bins came from Big Lots last year. They normally carry them every year, but the colors might be different. I labeled them using Maria Manore’s editable Classroom Library Labels (Black Series). The adorable pink rug came from Target. Directly to the right is our leveled library. I scrounged this shelf from a coworker this year, and I love how it fits all of our leveled readers. These are the books my kiddos choose from for their book boxes. I ordered these book bins from Really Good Stuff. They are the perfect size for my kiddos to carry to a quiet place and search for good fit books! You can read more about guided reading in my classroom here and here. Our listening center is stored on top of this shelf. The radio is one that I purchased my very first year teaching. I marked the play and stop button with a green and red sticker. This helps my kiddos be independent when listening to a story. The headphone rack is great for keeping the cords untangled, and the best part is… I inherited it! Directly behind this shelf is the little project my dad and I worked on this summer. When you are working in your room and have a vision of a shelf that would hold all of your math tubs, you make a plan and call your dad! These pink tubs are also from Romanoff Products. If you continue moving right, you will see my math and literacy storage shelves. They hold all of my math and literacy games, manipulatives, resources, center activities, and such. My aunt made the curtains for me last year. Believe me… you do not want to look behind the curtains! Well, I did organize the shelves on the right last week. On top of these shelves are my Treasures reading materials. The guided readers are sorted by unit in the lime green bins from Really Good Stuff. My teacher manuals are inside the turquoise bins from Big Lots. The cute pink lamps came from Family Dollar. Next up is this adorable hanging rocket from IKEA. I’m not sure if they carry this particular hanging storage unit anymore, but they do have others that would work. This is where I like to keep all of my puppets. Isn’t this frog adorable?! He’s my favorite! Ok! We are now to the wall opposite the door. If you stand at the door and look straight ahead, you will see the focal point in my room… my word wall! Last year, I layered the borders to help create a more dramatic look. Can you believe those cabinets below were once bright orange?!? I painted those last year, and they look soooooo much better! Just above my word wall are my Chalk Inspired Number Posters. I love how they pop against our drab, cream walls! 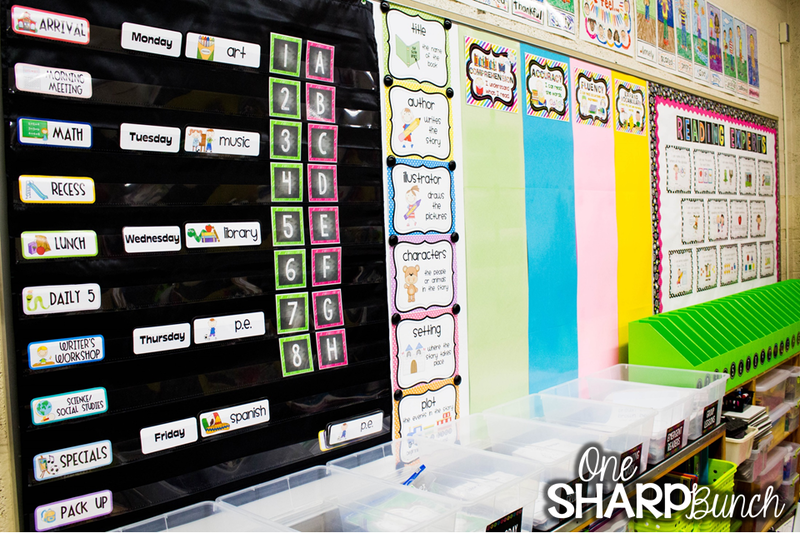 Click here to read some great bulletin board tips! To the right of my word wall are my literacy tubs. I found this rack at Target a few years back, but haven’t seen them recently. I added the wooden dowel so that I could fit two tubs inside each cubby. In the adjacent corner is my calendar area. Here, you will see my calendar, hundreds chart, and clip collection. The clip collection is a board with 18 hooks. Right now, it is empty, but we will start adding clips to the far right hook. Each day, we will add a paperclip by creating a chain. Once we have a chain of 10 clips, we will move them over to the hook to the left (or the tens place). This little DIY creation was brought to life by my wonderful hubby! To the right of this area is my teacher desk. I purposely left it out of the picture because it is a hot mess right now! And that concludes a complete 360 degree tour around my classroom! Don’t forget to head over to Lucky Little Learners and Schroeder Shenanigans in 2nd to check out more classroom reveals! Plus, you can find some great classrooms at Bloghoppin’! And, I know it’s not Wednesday, but I was incredibly busy with PD and Open House this week! For more classroom inspiration, check out my “Classroom Ideas” board on Pinterest! If you’d like to check out some of the items I have in my classroom, you can find them below. Wish me luck on my first day of school this Tuesday! I love your color scheme and organization! Your classroom looks fantastic! Everything looks great!! Have a great year! I love the colors! 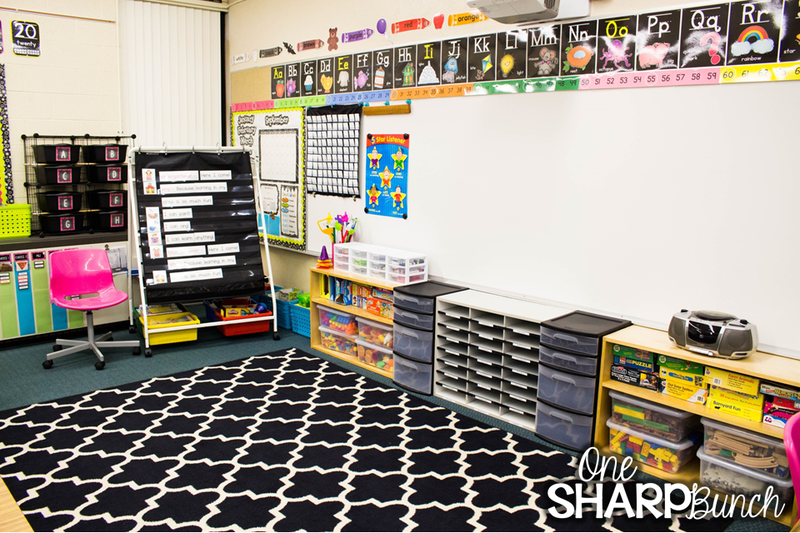 Your classroom looks wonderful and so organized! I just discovered this post, and I love your guided reading table! It's such an unusual shape! Can you tell me where you got it? Your room looks amazing. I have been thinking about making crate seats for my room. I have tile and we have to be careful with scraping on the floor. Did you use anything on the bottom of your crates to prevent this? Cute classroom! I love the pink roller chair next to your easel. Can you tell me where you got it? Love the room! With the Romanoff book bins, how did you get around the tax id #? I can't see the price and I'm just ordering them for myself. Thanks! I know you said your green bins are from really good stuff. Which ones are they exactly? I love them and the size! Love the crate chairs! They look like plastic crates, do they hold the children without breaking? Yes, they are plastic file crates/boxes. They hold me sitting on them!